3 used on a carrier. Incidentally, it lands at about 65-70 mph with flaps down, cruises at about 140 mph with flaps & landing gear up. We are now engaged in formation work & acrobatics, neither of which I have excelled at to date. In addition to the stunts we had at Pensacola we now are required to do a slow roll and a chandelle. After finishing formation & acrobatics sometime next week we shall start gunnery, firing at a sleeve towed by another plane. 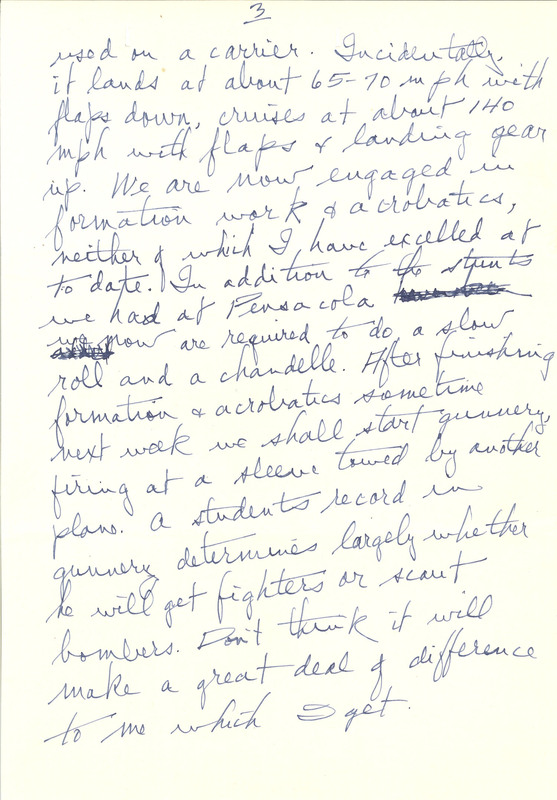 A students record in gunnery determines largely whether he will get fighters or scant bombers. Don't think it will make a great deal of difference to me which I get.